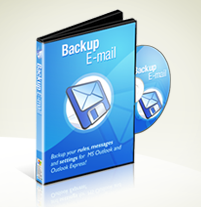 Backup E-mail uses an easy wizard interface to backup everything from Microsoft Outlook, Microsoft Outlook Express, Windows Mail and Windows Live Mail. All it takes is a single click and you're done! It'll even backup your Internet Explorer Favorites! Amazing features of our e-mail backup software. Backup E-mail can backup the most popular e-mail applications, Microsoft Outlook, Microsoft Outlook Express, Windows Mail and Windows Live Mail. It can also backup your Internet Explorer Favorites. Creating backups of all your important data has literally never been this easy! Move e-mail to another PC! Transferring your e-mail to another computer? Simply backup your e-mail on your first computer, then restore your settings onto the second. It'll be just as though nothing has changed. Your e-mail settings will remain intact! Backup E-mail backs up exactly what you want, and places it in one single file. This file is automatically compressed to ensure you get more bytes for your buck. You can also enjoy full security, by putting a password on every one of your archives. Backup E-mail can backup your e-mail messages direct to a CD-R, CD-RW or DVD drive. Plus you'll find full support for other types of media, including floppy disks, zip diskettes, network drives and other media. Users of Backup E-mail get full access to our support staff, accessible via our dedicated support site accessible from the widget found below. We guarantee to answer all your queries quickly and efficiently, with technicians regularly available to assist. If you're experiencing difficulties with our program or site, simply contact us via our dedicated support site accessible from the widget found below. We guarantee to answer all of your questions quickly and efficiently, with technicians regularly available to assist.